Extending a partition in Windows OS is not always easy. Sometimes during shrinking other partitions to create more space, the native Windows disk manager can only manage to give very little space that might not be sufficient for your needs. Other times, the OS completely disables the shrink functionality hence blocking you from extending specific partitions. This is where Macrorit Partition Extender excels. When dealing with technical aspects of the computer, a simple interface is what many users, especially novice ones, prefer. 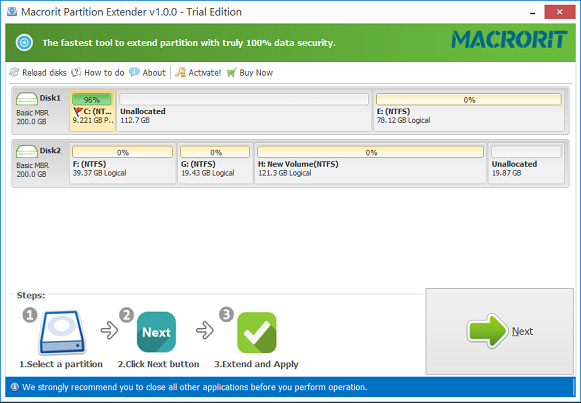 Macrorit Partition Extender has a very simple interface that allows you to extend a partition in 3 simple steps. The disks are clearly labelled showing used up and available space. The steps to follow while extending the partition are also clearly labelled. While some partition extenders might end up crashing your PC, Macrorit Partition Extender gives assurance that your data is 100% safe. However, I’d recommend that you create a backup of your data before you try extending partitions just to be on the safe side. I found the tool to work fast on my Windows 64-bit version, although I couldn’t test the same on a 32-bit OS. Macrorit Partition Extender is a combination of features that perform various functions including move, resize, create, format, and delete partitions. When combined, these tools make it efficient to extend your existing partitions to whichever size you need as long as you have enough free space on your device. Also, take caution when extending the main Windows partition since it might end up crashing. All-in-all, the software makes to the list as one of the fastest partition extenders you can find. •	Could do better with additional tools. As a partition extender only, it doesn’t have a place as an everyday software or one that can be used every fortnight for that matter. Macrorit Partition Extender does an exceptional job in extending the disk partition sizes which can be helpful especially if the partition with your OS is running out of space and you just can’t afford to format your PC. The manufacturers guarantee 100% data safety, and it is fast and efficient. The software is definitely worth downloading. You wrote “Also, take caution when extending the main Windows partition since it might end up crashing”. The whole purpose of this software, as far as I can tell, is to extend the systems partition, so how can they “guarantee 100% data safety” if you are suggesting the program may “end up crashing” the system.